Today, Melissa is sharing on her blog tips and tricks on creating windows in your projects that contain scenes to tell a story. Click here to visit Melissa's blog to see more! Lizzie Jones (newsletter editor extraordinaire!) is taking the time to create printable, pin-able inspiration cards each month based on some of the most unique projects from the past month. We are pleased to share the cards featuring the recent November Release! Scroll to the bottom of the post for a link to a pdf download that you can print. 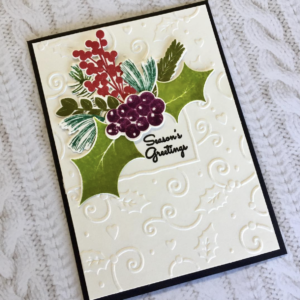 Click Here for the November 2017 Release Inspiration Card Download! Welcome to Throwback Thursday at Papertrey Ink! Today we have a few of our design team members revisiting the Love Lives Here: Holiday stamp set. Click here to visit Melissa'a blog to see more! "The Love Lives Here: Holiday set has a pretty, nostalgic feel that’s so perfect for the holidays! The angel from the set is the perfect focal point for this dreamy card with a bit of rustic charm. Stop by to check out the layered scene I created using this great set!" Click here to visit Betsy's blog to see more! "This is such a classic holiday set! I love the details of all the solid images, but what I love the most are these beautiful evergreen garland that have such stunning details." Click here to visit Keeway's blog to see more! --Create a project utilizing your take on the challenge. Your project must use at least one Papertrey product and use layers on your project. --You will have until 6am, Monday, December 4th, to add your link to the list to be eligible to win. --One randomly selected winner will be chosen from ALL the entries on Monday, December 4th, after 6am. The winner will be posted here on this blog post, on Twitter and Facebook. The randomly selected winner will get a $25 PTI gift certificate to spend however they like! Congratulations, Jenny Martin! Please send an email to customer service and provide them with your full name and the email address you would like your gift certificate sent to. Thanks so much to everyone for playing along! This week's Make it Monday post will be delayed due to unforeseen circumstances. Thank you for your patience and we hope to have it up and running as soon as possible!